Wow, was this a disappointment, or was it? 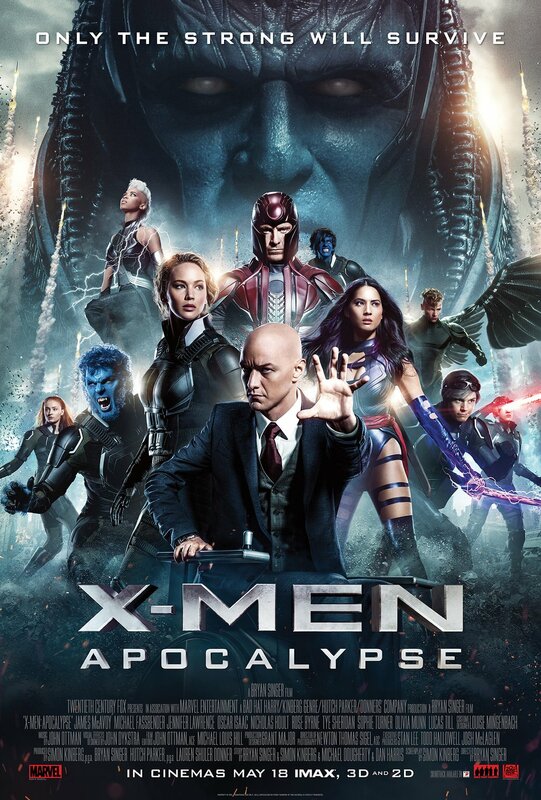 Directed by Bryan Singer who has helmed the three best X-Men movies in the series, coming after his phenomenal X-Men Days of Future Past (2014) which felt like a home run for the franchise, this feels more like a sacrifice fly. X-Men Apocalypse is not great, but it gets the job done. The opening shot of sand dunes and James McAvoy’s voice-over narration immediately makes you miss Patrick Stewart and long for his iconic voice to take us into the picture. Apocalypse starts right where the end credits teaser from Days of Future Past left off. We begin in Egypt where we meet the title villain played by Oscar Isaac, who sadly just looks silly under all those prosthetics. Instead of being an intimidating, all powerful, super mutant, he looks more like Ivan Ooze from the terrible Power Rangers movie. There is a big opening action scene where he gets trapped under a pyramid and then we have the standard opening title sequence for all the X-Men movies. This one is a little more fun as we see some images throughout the history of mankind leading up to the signature ‘X’ doorway. Then the story gets underway with Apocalypse waking up and gathering his four horsemen to help him destroy all human civilization. Why does he want to do this? No real reason is given. Of course it is up to our X-Men led by Charles Xavier (James McAvoy) to stop him. The acting is good but as mentioned before the presence of Patrick Stewart, Ian McKellan and Hugh Jackman who does appear as Wolverine but is relegated to a dialogue-less cameo, are greatly missed. Whereas Days of Future Past, the plot allowed for all the actors to appear in meaningful roles. That movie felt like an All-Star game. This feels more like a necessary film to push the franchise further, but it is not without its benefits. 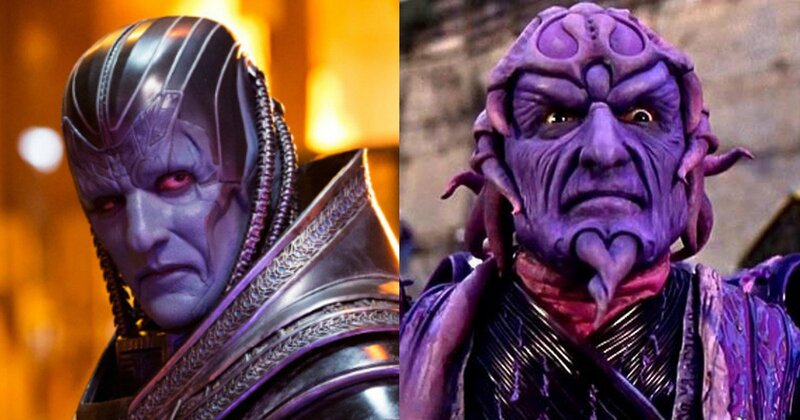 Oscar Isaac as ‘Apocalypse’ (left) and Ivan Ooze from ‘Power Rangers’ (right), or is it the other way around? The cinematography and special effects are quite stellar and John Ottman’s music score is top-notch. I even loved the way they used the Metallica song “Four Horsemen” as Apocalypse is gathering mutants that will help him. Jennifer Lawrence returns as Mystique and the script is tailored to give her a lot of screen time. She does fine in her scenes. All of the actors are serviceable, other than Oscar Isaac looking silly and hardly acting at all under the heavy make-up. The lone stand out performance is Michael Fassbender as Magneto. He has a few tragic scenes that deal with death and loss. He really delivers an emotional performance that hits all the right notes and comes across as being better than the film deserves. He grounds the movie when it could have been just camp, and adds a maturity none of the other performances had. But the background for his character being a Holocaust survivor and seeing the darkest side of mankind really drives not only his subplot but the rest of the story, and makes X-Men Apocalypse work better than it should. The film itself lacks creativity and adds a lot of character and story inconsistencies to the franchise. But that is hardly something new to the X-Men series. The biggest problem with X-Men Apocalypse is that it feels like a movie made solely for young adults. That is probably due to the predominantly young cast. One who remembers the earlier X-Men films will long to see Brian Cox as Stryker, he was far more menacing and believable than young, cool, flavor of the month Josh Helman. The dramatic impact of previous films is not there. X-Men Apocalypse lacks a sense of sophistication and wisdom. At times it is downright silly and unintentionally campy. Also, at 144 minutes, some parts really feel long and it could have been edited down. Even though some of the earlier, better X-Men movies feel more like they are for everyone, Apocalypse is by no means a bad movie. It has its flaws, but it delivers what the audience wants and expects from an X-Men movie. By the time it was over, I for one, was ready and excited for the next installment and hope that this time we see all of the X-Men together again, visiting the Savage land and taking on Mr. Sinister. Instead of uploading the trailer, which was rather mediocre, here is the aforementioned Metallica song “The Four Horsemen” used perfectly in the film.